New Inn Community Hall (formerly Panteg Public Hall) is a registered charity (No 524368), which provides accommodation and other community facilities for the people and organisations of New Inn and the surrounding district. It is managed on behalf of the residents of the village by a management committee which includes a group of up to eight trustees whose signed acceptance of this responsibility has been registered with and is being held by the Charity Commissioners. The management Committee also includes 16 members elected at the AGM with one third being elected each year. It includes representatives of user organisations. 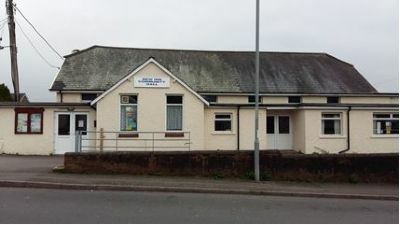 Unlike many other community halls in Torfaen which were provided by the local Council, the building of the Public Hall was paid for by local public subscription... Because of this, all the costs of maintaining the building and its equipment have had to be raised locally although a certain amount of assistance has been received in the forms of grants from Pontypool Community Council, Torfaen County Borough Council and local Councillors. It is pleasing to note that nearly 38 years after the Public Hall opened in its present form (and nearly 80 years after the oldest part of the building opened); the hall is as popular as ever. It used regularly by numerous organisations, individuals and families and is an integral part of the local community. In spite of this, the management committee are constantly in need of additional helpers and ideas for raising the funds needed to keep the hall open and preserve the fabric of the building. All offers will be gratefully received. During the Second World War many functions were organised in New Inn to raise money for charities and on a number of occasions the need was felt for a hall where concerts and other public activities could be held. Although the Church and Chapels had halls, their use was very much restricted at that time and often the only place available for hire was the old school building on the Highway which is now the Family Learning Centre. Because of this, in July 1943 a public meeting was held at which a constitution was adopted and a management committee was elected pledging themselves to provide the village with a Public Hall. The committee worked hard raising funds and in little over a year a site in The Walk had been purchased and a balance of £90 remained in the bank. This site is now occupied by the three shops and the pensioner’s bungalows. The efforts of the committee continued but in 1948 when detailed plans had been prepared for the building of a magnificent hall, the County Council Planning committee refused planning permission on that particular site. Negotiations took place and in 1950 the Pontypool urban District Council offered a plot of land in the corner of the playing field (where the children’s play area is) in exchange for the site in The walk. Many sets of planes were considered with building costs continually rising but in 1953 all was agreed and the Committee were making the final arrangements for the start of the building. Occasionally since 1946, suggestions had been made that the old Pontypool road Institute should be handed over to the Public Hall Committee. The Institute had been built in 1914 as a result of agitation by the young men of New Inn. Since about 1910 they had been using rooms above local shops opposite the Rising Sun Inn as a reading room and a billiard room but the accommodation was hardly adequate. The new Institute was a welcome replacement and it was a popular venue for a number of years until the local bus service began. This started its decline as travel became easier to the entertainments at Pontypool, Newport and Cardiff. During and after the Second world war the Institute was hardly used. It was becoming dilapidated and it was running a debt so in 1954 the Institute committee agreed to hand over the building to the Panteg hall Committee. This caused a sudden change of plan and the architect Maj. Dawkes set about drawing up a completely new design utilising as much of the old Institute building as possible. It was decided to extend the main room to double its length and add a stage and dressing room at the end. The smaller room would be converted into a kitchen and toilets would be added. The plans were approved and the work commenced without too many problems. The after a flurry of activity when committee members and others spent all their spare time wielding scrubbing brushes, paint brushes etc. the Panteg Public Hall was ready for use and was officially opened by the Rt. Hon. Lord Raglan on April 21st 1956. The final cost at that stage was £6,000. After that date the Public Hall was in constant use and it soon became apparent that a car park was urgently needed. The opportunity arose when the lease of the land immediately behind the Hall, which had been used as a vegetable garden by a local resident, became available. After negotiations, the plot was divided between Panteg Hall and the builder, who at the time occupied the neighbouring yard. The popularity of the Public Hall did not diminish and it was often difficult to accommodate all those who wished to use it. And so in the early sixties it was decided to extend the building by adding a lounge with adjoining kitchen with serving hatch, an additional toilet and cloakroom. These were completed and were officially opened by Col. Roderick Hill on 5th December 1964. In the years which have followed many changes have taken place in the fabric of the building, the way it has been managed and the people who have served on the management committee. But the village has always been fortunate in having volunteers willing to give of their time to assist in the running of the Public hall. It is pleasing to find new people coming forward to work for the benefit of others and there has always been a happy blend of these and veteran members. So for nearly four decades, the Public Hall has provided an essential facility for the residents of New Inn and for countless village organisations. May it continue to do so for many years to come. Originally written by L.W. Hough Oct. 1993.